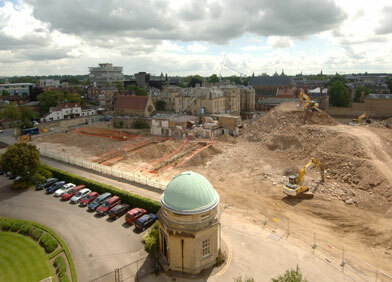 The Radcliffe Observatory Quarter is a large scheme of new educational facilities for Oxford University. It will proceed as a number of major development phases, over several years and occupies the site of a former hospital, the Radcliffe Infirmary. This covers a total area of c 3.7 hectares to the north of Oxford city centre. 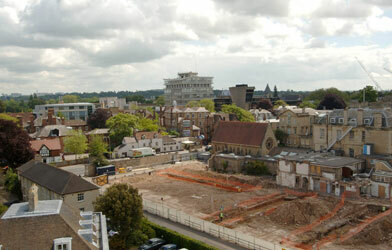 Listed buildings forming the original nucleus of the hospital (founded by John Radcliffe c 1769) are being retained. Across the remainder of the site, the development will include a substantial new basement that will remove any surviving archaeological features and strata. Accordingly, in 2008, the University commissioned a detailed report on the archaeological implications, from Museum of London Archaeology. This study identified an archaeological potential for a Bronze Age barrow cemetery, possibly re-used during the Saxon period; for the medieval hamlet Barrowcroft (the place name indicating that prehistoric barrows were still visible features in the landscape as late as the 12th century) and for buried remains of the original Infirmary, including the hospital graveyard. In the light of this potential, an archaeological field evaluation was then undertaken using test pits and trial trenches. This enabled a good predictive model of archaeological survival to be produced, zoning the site into areas of high, medium and low archaeological potential. Remains of three large (probably Bronze Age) ring ditches have been located, together with evidence of Saxon settlement; and structural and horticultural evidence associated with the grounds of both the 18th/early19th century Infirmary and the adjoining Radcliffe Observatory. Saxon burials and medieval settlement have not been located, although there is evidence of agricultural activity. Following field evaluation, the five areas of medium and high potential (totalling c. 2 hectares) have been cleared of modern overburden, to allow a wider ‘strip, map and sample’ archaeological excavation to take place. Two potential timber structures have been recorded in Area 1, together with numerous postholes, some in linear arrangements (possibly fence lines) but many others in irregular patterns. These features lack dating evidence, but could represent the rear yards of medieval settlement plots. The Saxon sunken building located in evaluation of Area 2 has been further investigated. 19th-century bedding trenches from the hospital gardens have been recorded in Area 3. Work on the former barrow here indicates that it was originally a double-ditch monument. Fragments of prehistoric (Bronze Age?) 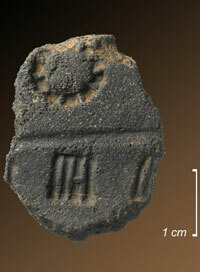 pottery have been found within the primary fill of the outer ditch, whereas later fills have given an Optically Stimulated Luminesence date of 2880 years BP, indicating the late Bronze Age/Iron Age transition. The largest of the three former barrows, in Area 4, also has double ditches but in this case the internal one has a sub-rectangular shape, raising the possibility that this is an earlier mortuary enclosure. Although no associated pottery has been found, this enclosure has produced bone and charcoal suitable for absolute dating using the Carbon 14 technique. Similarly, the bone from two secondary human cremations outside the ring ditch, although not placed within pots, will also be sampled for C14. In addition to exposure of the third ring ditch, excavation in Area 5 has revealed a stone cellar and well from a range of 18th century structures to the rear of the original Infirmary. When these went out of use, they were filled in with 19th century hospital refuse including, not surprisingly, a large number of chamber pots. The excavation concluded on 25th September 2009.